Last year, a buddy and I tried to do the Bierstadt/Evans combo with the Sawtooth, but got to the summit of Bierstadt just as some serious clouds started to roll in, forcing us to return back to the car somewhat defeated (we'd both done Bierstadt before). This year, I decided not to waste time on Bierstadt again (don't get me wrong, it's a great mountain, but I wanted to hit Evans this time! ), so I decided to follow the route called out in Roach's book up the gully about 1/2 mile to the north of the Sawtooth. 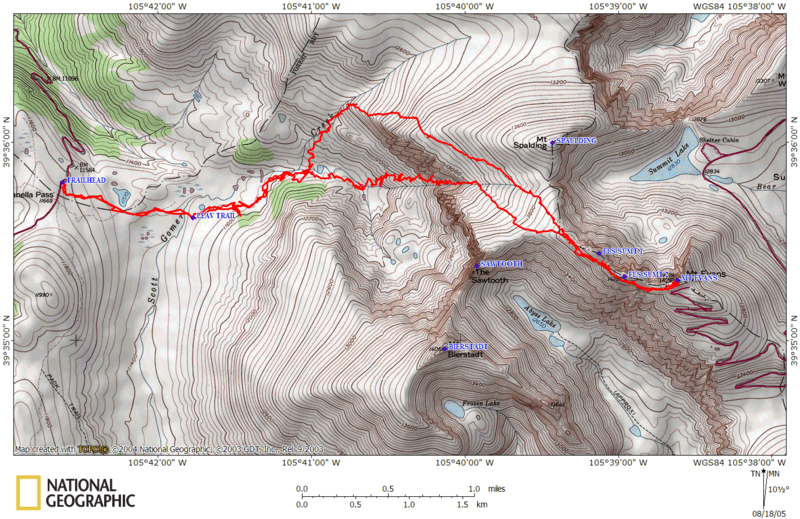 I should point out that we attempted to closely follow the route described on 14ers.com, and found it to be pretty accurate (as always). We eventually approached the basin below Bierstadt and the Sawtooth, and picked a decent spot to cross the stream amongst beaver dams. The ascent up the gully looks incredibly intimidating, but it really wasn't that bad. The first quarter of it you can ascend the grassy slopes up to it until the rock gully tightens. Here, you can either take a "trail" of scree and loose dirt that's very steep, or simply scramble over the boulders. The trail (if you could call it that) was really slick, so we ended up just scrambling over the very stable boulders (all class 2). Be sure to take a look back over the Scott Gomer Creek area, as the view from this location is breathtaking (plus you are gaining elevation so quickly, it really is very surprising). After about 700 feet of tight scrambling, the gully widened back up, yielding a more solid trail (much to the joy of my hiking companions). We kept climbing this until we were completely out of the gully, and onto the ridge (just passed the Sawtooth, really). At this point, you're really at around 14,000 ft, with little more to go in elevation. I had read in Roach's book about the ridge walk over the top of three false summits, but somehow we ended up on a trail about 100 feet below the crest of the ridge on the west side. This suited me fine, as I'm not all that big on exposure (mostly because I'm a klutz) and we followed the trail until it ran smack into the trail that ascends from the summit parking lot. The summit, of course, was crowded with tourists and people who had "hiked" up from the parking lot. It was a bit more anticlimactic than I had expected (Pikes Peak was more fun...we were a tourist attraction up there), but I enjoyed it nonetheless. Our descent route differed a little. One of the hikers with us didn't relish the idea of descending down through the gully we had climbed through (and I can't say I blamed him), so we took the "long" way around, which is to skirt northwards around the cliff band down the grassy slopes that feed down into the Gomer Creek area. This was okay, but it added a mile or two to our hike, and the never-ending slope really got tiring after awhile (I think I would have preferred an hour of scrambling down boulders than 2 hours of slope walking). Even more fun was the "trail" that awaited us. There were lots of cairns marking a supposed trail down into the basin, however we failed spectacularly at finding it. Whereas our ascent path led us on bits and pieces of trail, we seemed to miss them entirely on our descent. We ended up just plowing through willows up to 6' tall in some spots. We found a reasonable stream crossing and resumed our maze-like adventure trying to find a trail. At this point, we were pretty tired and baked, but we had to appreciate the sheer amusement in these willows, and how, at one point, my wife asked me to stick my hiking poles up in the air so she could find where I was at. After an hour or two of willow bashing, we finally emerged onto the solid Bierstadt trail (for which I've never been so thankful) and returned to the car. All in all, this is a pleasant route up Evans, but be prepared for an "adventure" through the willows!